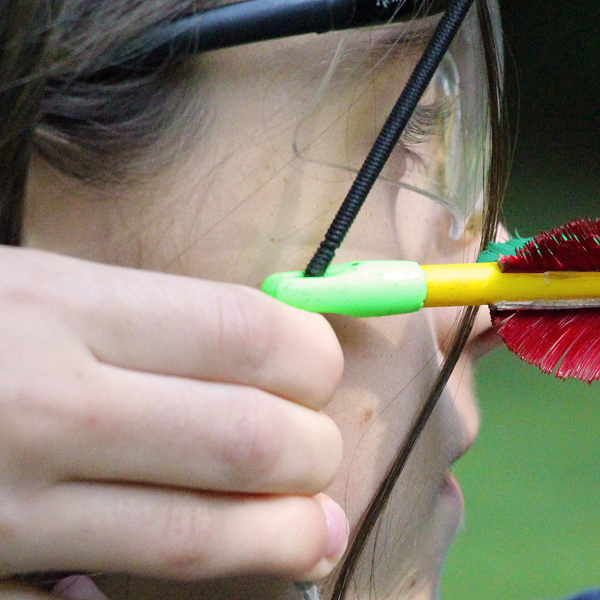 During my time as an archery instructor this summer, I have noticed in some campers an expectation of high performance during their time on the range. 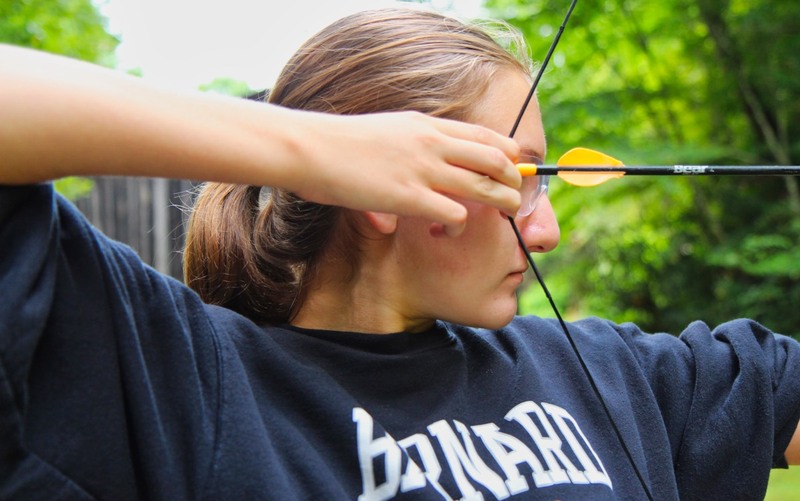 Archery is a sport that requires an understanding of basic from when shooting, such as keeping your elbow up when you pull the bowstring back, keeping your feet parallel and a shoulder length apart, and keeping your arms straight. Often, if a shot does not land as expected campers can be quick to say “I’m not good at this” or “this is not for me” even after one or two tries. Admittedly, I have been this camper myself, and as I’ve transitioned from camper to counselor I have grown to recognize these kinds of perfectionistic tendencies in both myself and in campers. Perfectionism, “a refusal to accept any standard short of perfection,” can be taught and internalized in children in many ways, especially in school where high achievement, high grades, and high standardized test scores are the expectation. Standards such as these are not inherently bad and can lead to greater success, but there can also be consequences that oftentimes lead children lacking confidence if they feel they aren’t achieving as well as they think they should be. 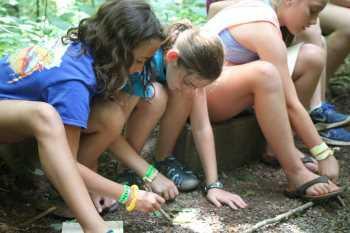 Camp is a place for girls to leave perfectionism behind. It is a place where mistakes are understood as a part of the process of life and learning. 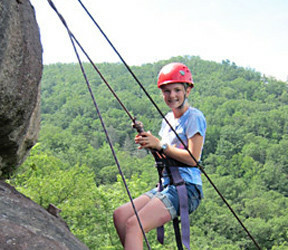 Without the added pressures from high expectations, campers live their camp life to the fullest, and in the most fun ways possible— and giving girls the confidence to decide for themselves how they want to spend their days here. 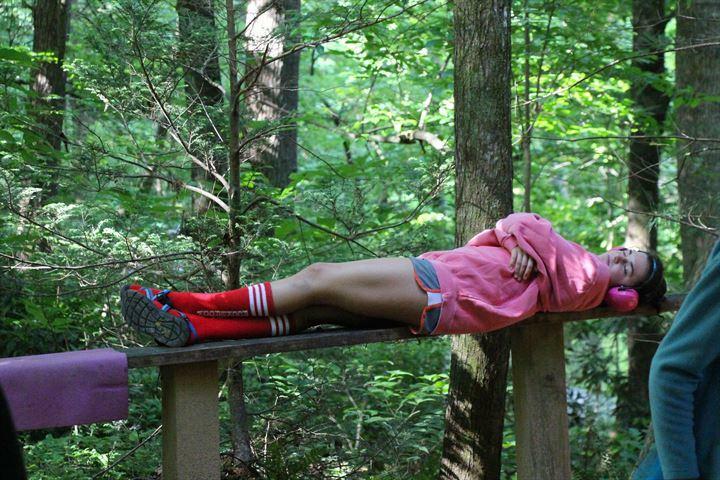 As a camper, I always felt at ease during my summers at camp. The pressures of home and performance never affected what I did here, and I was always supported in my endeavors, even if I felt I had made mistakes. Making something because I wanted to and not for anyone else was also a freeing feeling. Now as a counselor, I try to give campers the same support and ease. 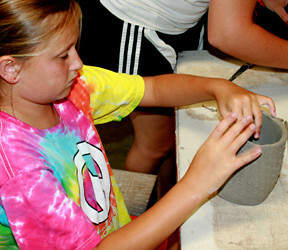 In pottery, when we make slab mugs some campers will say “I don’t like how this turned out, can I have a new slab?” to which my fellow instructor and I reply “just flip it over and start again!”. Even if the camper does not like what they’ve made at first, trying something new or turning a mistake in an intended design can make a piece look even better. As a counselor, one of my favorite things to do is watch evening program camper skits. Certain nights the cabins on each line are given a wacky theme to create a skit around such as “Christmas in July” or “Moana meets Frozen”. 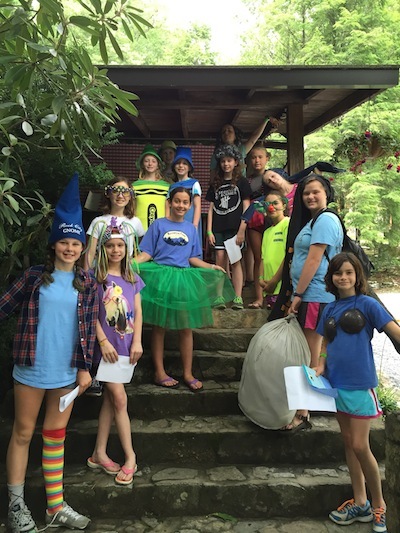 Skits are a wonderful time for campers to let their creativity shine, design and wear funky costumes, and learn how to work together as a group. The campers never fail to come up with hilarious and out-of-the-box performances, and seeing the girls cracking up at their own antics during the skit and laughing together afterwards is always a delight. 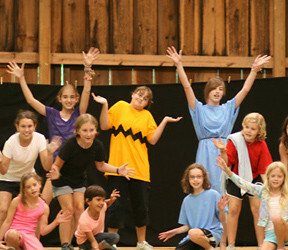 There is no right or wrong way to create a skit— no way to make it “perfect” —and I believe that is why the campers have so much fun making and performing them. 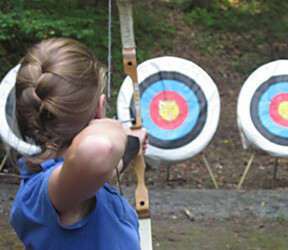 To conclude, at the start of this past rotation in Archery I was teaching a girl who, after a few arrows missed the target, claimed “I’m just not good enough at this.” However, as my co-instructor and I gave her a few tips and she got more used to shooting the bow, her aim became more accurate. At the end of class that day, four of her five arrows hit the white of the target and she cried with joy “I got them on the target! Look! I did it!” and she received congratulations and cheers from the other girls in the class. Today, that same camper got a bullseye! She was astonished and proud and we all cheered together. It was a great improvement from the first day of class, when she had expected a great shot on her first try. 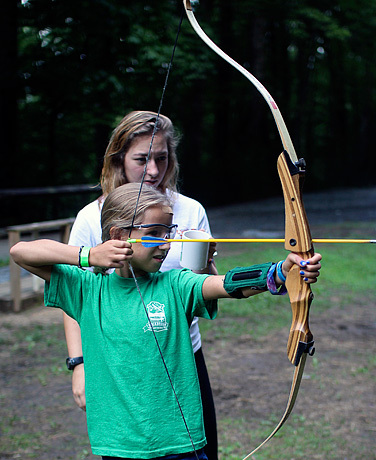 With guidance, practice, and confidence girls can do anything they set their minds to, and here at camp it is known that mistakes are just a part of learning. 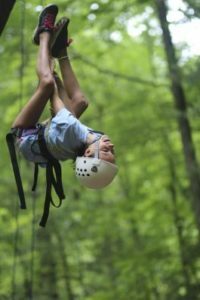 “Letting go” is a phrase that seems particularly apt when you consider life at camp, even more so at an overnight camp like Rockbrook. In so many ways, the campers let go of the familiar while they’re here. Think about it. They find themselves sleeping in rustic, 90-year-old wooden cabins with eight or so other people. When they look up in their bed, they more than likely can spot a spider or two. Instead of the whir of an air-conditioning system as they fall asleep, the sounds of crickets and other nocturnal forest creatures linger in the background. Even what they eat— homemade hummus, grilled barbecue tempeh, corn tamales, and strawberry white chocolate muffins, for example —is foreign to many of the girls. All of their familiar screens— TVs, computers, smart phones, and tablets —gone! 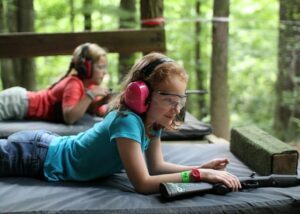 And of course, most of the activities at camp offer new experiences, from shooting a real gun, climbing a real rock, and using a vintage floor loom, to diving into the freezing cold water of our lake. With so many new things, it’s impossible to cling to what you already know. There’s more. 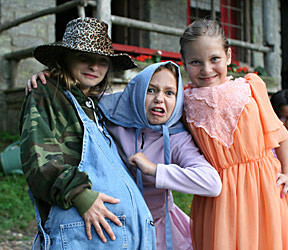 Camp girls, simply by virtue of being away from home, also let go of their parents in certain ways. Free from the prescriptions, intervention, and inspections of mom and dad, this means making all kinds of decisions on their own. It might mean deciding to adjust certain habits of personal hygiene (brushing hair or taking a shower less often for example) because more important (i.e., more fun) things are happening like a ga-ga ball game before lunch or great conversation before bed. Being at Rockbrook, girls don’t depend on their parents to fill their free time, to dictate what always comes next, or to solve every problem. 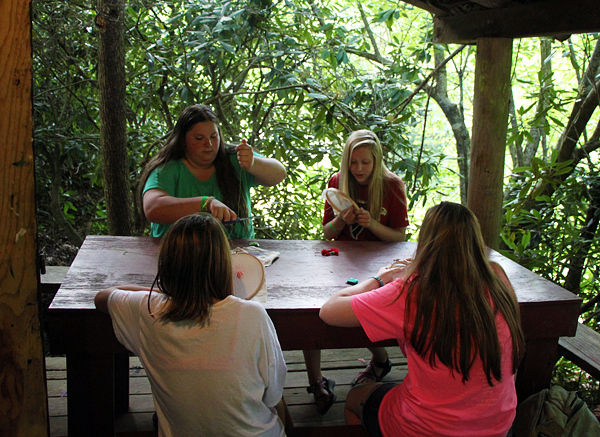 Of course, there are excellent counselors here, wonderful people to guide this freedom, but camp gives girls the opportunity to experiment with things and gain more confidence after seeing how their decisions turn out… good and bad. Asking the campers themselves about how they feel at camp, I’ve heard the older girls say camp is their “happy place” where they can let go of their worries. Different from the competitive atmosphere of school and the insecurities it can breed, the Rockbrook community is defined by compassion, kindness and generosity. 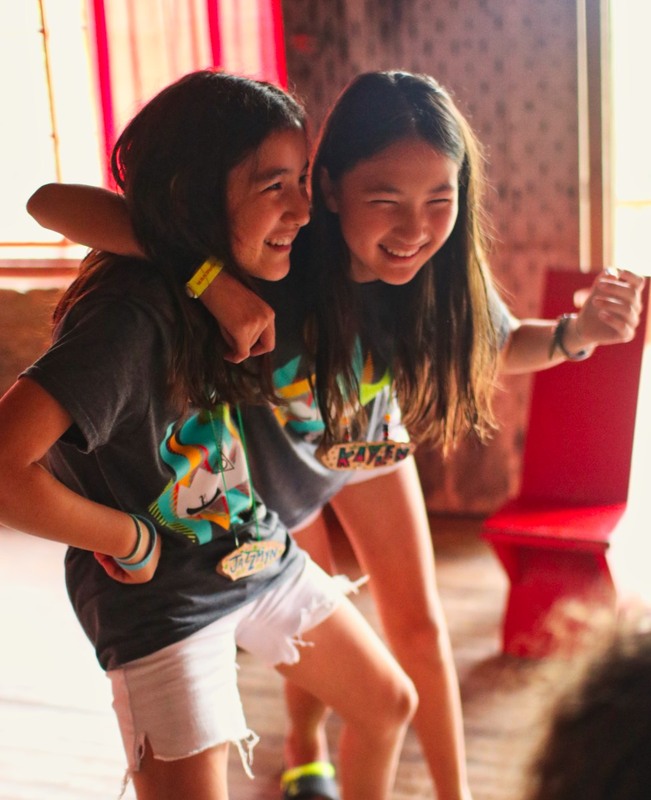 Camp is a place of encouragement where, instead of being left out, ignored, or put down in some way, girls feel supported, respected, and affirmed. In this kind of community, girls don’t worry about how they look, whether or not they’re “good” at a particular activity, or if they’re “cool” enough to be included. All those worries fade away at camp when the point of things has nothing to do with evaluation and everything to do with simply having fun. Letting go of worries like this also empowers a girl to let go of her polished persona, that “face” she believes others want her to be. Joining a camp community like Rockbrook, knowing she’s truly a part of it, trusting the people around her and caring for them in the way they care about her, inspires her true personality, spirit and character to shine through. It can be a remarkable transformation for a person. 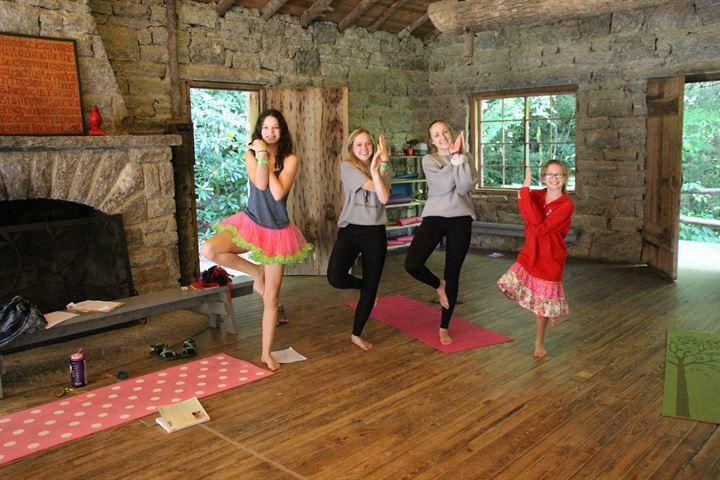 By being so supportive, camp opens up a space for a girls’ authentic self to emerge and grow. So after letting go of all these things at Rockbrook, what’s left? Simple stuff: Authenticity, Nature, Friendship, Joy, Creativity, and Community… a life that feels really good. That is camp. 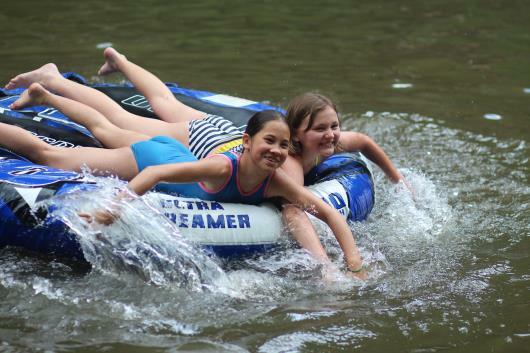 Every summer, on the first full day of camp, it strikes me how little time it takes for the “spirit of Rockbrook” to take hold on our campers. 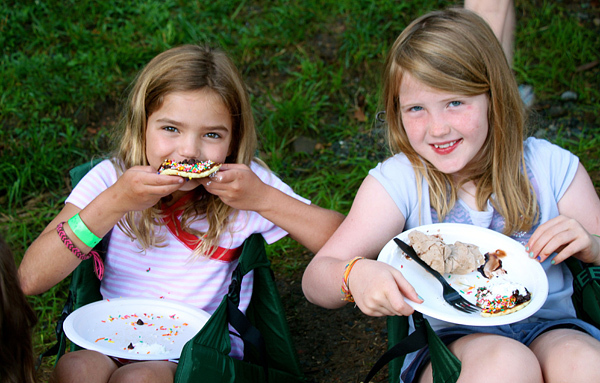 Within the first 24 hours, our campers transform from the quiet, polite children who arrive on Opening Day into true Rockbrook Girls (who, while always polite, are rarely quiet). 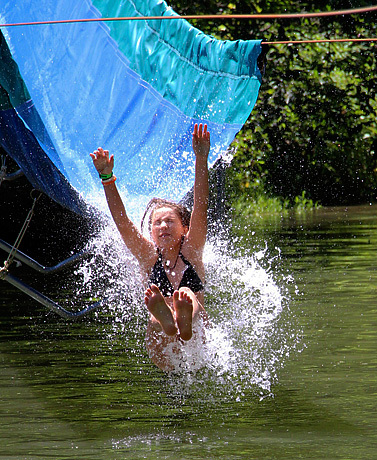 Through the courage of jumping into the lake for the swim demos yesterday, the creativity of planning and performing skits with their cabins last night at Evening Program, and the sheer adventure of setting out this morning for the activities that they themselves chose, those handy manners that school instills in them are stripped away in preparation of three weeks of carefree fun. Gone too are some of the inhibitions that might hold them back from taking fun and crazy chances in the “real world.” Girls who have been nervous around horses their whole lives chose to step into the barn this morning. Girls who swore up and down all year long that they wouldn’t do the camp swim demo completed it yesterday afternoon and earned their green bracelet. Girls who dreaded opening day all year long, sure in the knowledge that they would be homesick, began to realize that they are strong enough to make it through, and even enjoy, nearly three weeks away from the comforts of home. 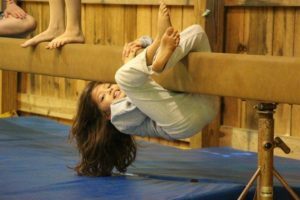 Most wonderfully, though, campers are putting away their self-consciousness and desire to “fit in” with the crowd, and have begun to let their inner zaniness shine through. They are realizing that camp is a place where “weirdness” is not only tolerated, but welcomed and encouraged—a place where differences are celebrated. Silly songs in the Dining Hall? No problem. Creating a skit about Cinderella and Hannah Montana starting a dance party on the moon? Totally normal. Wearing pants on your head to dinner? All par for the course. There were three Juniors in particular who embraced that philosophy last night, when they stood up and made the announcement at dinner that, “Rockbrook is all about having fun, and sometimes to have fun you have to get a little weird.” They then challenged their fellow campers to dress as weirdly as possible for today’s meals. Our Rockbrook girls, new and returning, rose marvelously to the challenge. Breakfast, lunch, and dinner were populated by walking bananas, ketchup bottles, aliens, pants-on-head wearers, giant sunglasses, and more. It is amazing to see the transformations that only a single day at camp can bring about; and even more amazing to consider how our campers will continue to grow and change between today and Closing Day. It had never crossed my mind that new situations involving unfamiliar people or circumstances could be uncomfortable for some, especially friends I knew well. I thought this was a skill acquired by adulthood, one that came with age. I had obviously taken for granted these social skills that I acquired at camp, where I’ve been coming since I was 7, which required me to meet new people and try new things every summer. 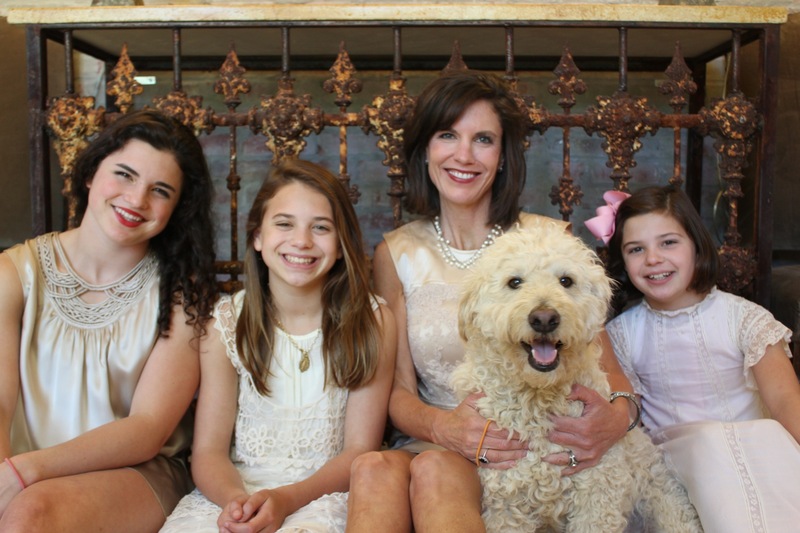 I’ve realized I have been mistaken in assuming situations like this were easy for all, as I have often purposely met other moms outside of school, meetings, and sporting events to prevent them from feeling uncomfortable by walking in alone. I’ve recognized that the inexplicable confidence and laughter still comes naturally for me, as I was the only mom who stuck to the dress up plan and showed up to the premier of Hunger Games with pink hair. I’ve come to better understand that the unfamiliarity of people and situations surpasses the comfort zones of many, making the prospect of walking into a room with strangers and making a friend seem impossible. I’ve now developed an even better appreciation of how these skills are developed as I’ve gotten the privilege to watch your children cultivate friendships and give birth to these character traits here at RBC. 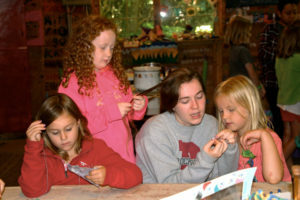 I recognize the confidence they develop when they come to camp not knowing anyone and yet leave with lifelong friends. As a mom of 3 girls, these are skills I can’t teach my children. These are skills that I’m grateful they have had the opportunity to gain here at Rockbrook. I’ve also come to the realization that some of the tightest bonds I’ve formed have been with friends who were “camp girls,” long after our camper days were over. They were instantaneous friendships, because we immediately knew we were alike in so many ways. We had survived screened cabins, appreciated nature, respected various personalities, experienced new things, desired leadership, and possessed camp silliness. 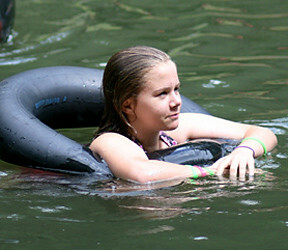 If you are a parent of a camper reading this, let me assure you that you are providing a lasting legacy for your daughter. This opportunity is equipping her with a skill set that may seem invisible at first but that she will utilize throughout her lifetime. There are no words to adequately describe the bond camp creates or the traits acquired here, but the experience speaks for itself. 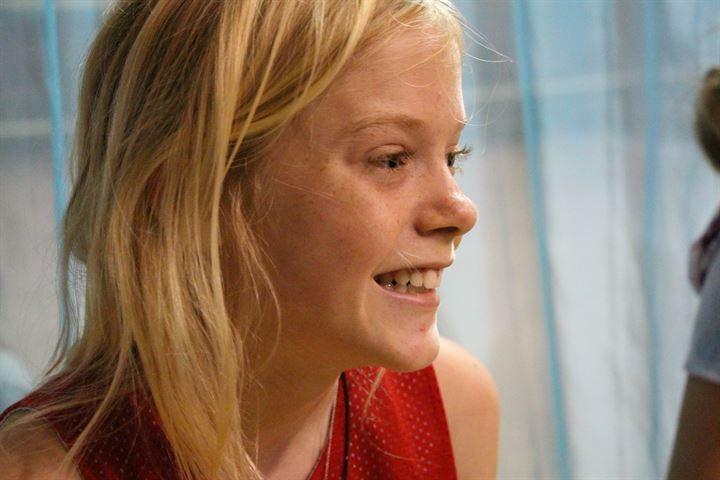 She will continually reap the benefits of her camper experience throughout her life, and it will shape the person she becomes as a grown woman. 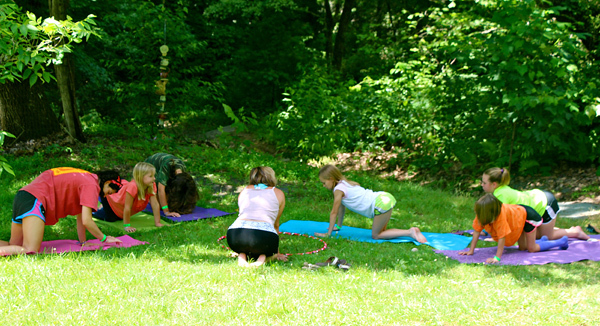 Camp birds are of one type of feather, and the bonds of the flock will always keep them together! 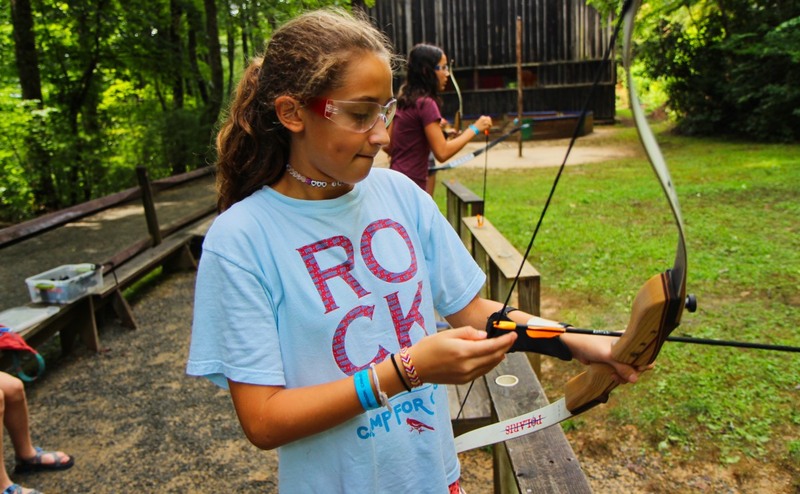 It has always been part of Rockbrook’s mission to go beyond simply entertaining our campers and to focus also on how we can provide more lasting benefits to the girls who attend camp. We certainly work to make sure everyday here includes something delightful, surprising and fun. 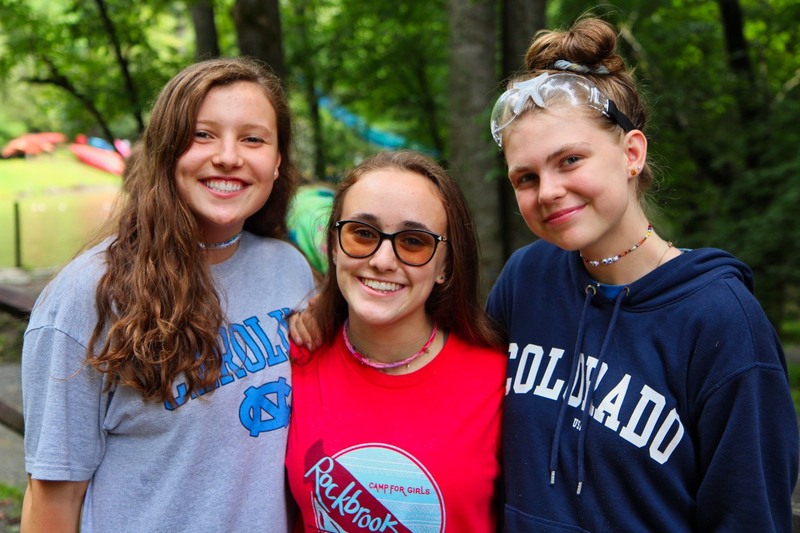 If you merely look at the variety of activities available, all the free time options, and daily special gatherings (Twilight periods, Evening Programs, dining hall skits, assemblies, and all-camp events), it’s clear Rockbrook girls are having a blast. They’re outside, they’re actively engaged with creative, adventure, and athletic interests, and they’re laughing their heads off along the way. But of course camp is much more than a series of amusements. It’s almost cliché to say it— partly because we (and others) talk about it a lot! 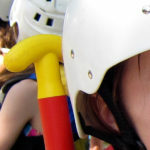 —but there’s no doubt that a positive sleepaway camp experience helps build important character traits that serve children well later in life, traits like those “21st Century Skills” you may have heard about: Communication, Confidence, Compassion, Cooperation, Collaboration, Creativity, Courage, and so forth. 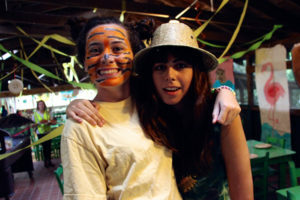 There are many aspects of camp life one could name that contribute to this transformative power: its emphasis on positive human relationships and the friendly, tight-knit community we enjoy, coming immediately to mind. There’s a starting point, however, I would say even a prerequisite to this character growth, something that if missing will reduce the camp experience to merely a vacation, or some other fleeting form of entertainment. This would be a legitimate worry if not for the structure of camp life. Keep in mind that at camp the campers can’t do simply anything they chose. The freedom camp provides to act independently without parental authorization comes with significant limitations as well. There are, for example, clear procedural rules at camp— a daily schedule of activities, safety protocols, and how to clear dirty tableware after a meal, to name a few. Perhaps even more importantly, there are likewise social expectations where the girls realize the importance of treating each other with kindness, caring, generosity, honesty, and respect, for example. 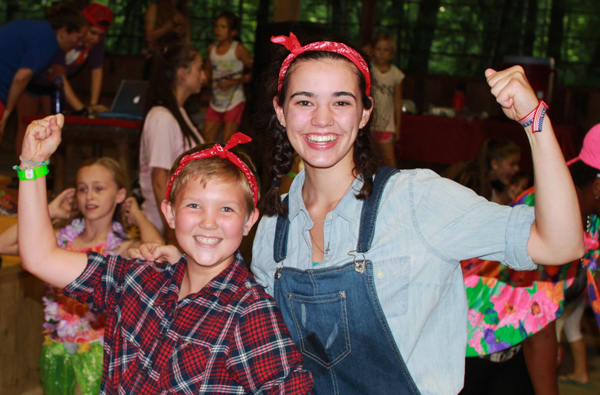 The camp environment, our culture and community, is built upon the support of these structural and social limits, and the camp staff, our cabin counselors primarily, serve as nurturing role models who embody the ideals from which they are derived. What we have at camp is freedom with limitations, or to put it differently, independence with responsibility. This is important because one without the other would critically fail our campers’ developing character. At one extreme, unstructured independence would lead to an “anything goes” form of chaos, and kids would fail to grapple with the 21st Century skills mentioned above. At the other extreme, rigidly scripted behaviors would rob kids of their decision making power leaving them with mere recipes for life poorly suited to cope with the complexities of a changing world. 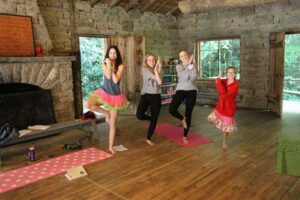 Camp life finds that balance by providing girls the freedom to make their own choices while also taking great care to guide those decisions appropriately. And it’s this balance that teaches kids how to be responsible. So while she’s choosing to go whitewater rafting, or to spend a quiet afternoon decorating a memory box in KIT, or perhaps chatting with a friend on the hill after dinner instead of taking a shower, she’s exploring how to act responsibly as well. By absorbing the positive values of camp— things like respect for others, appreciation of Nature, and courage to try new things —she’s developing qualities that will help her navigate responsibly in the future. 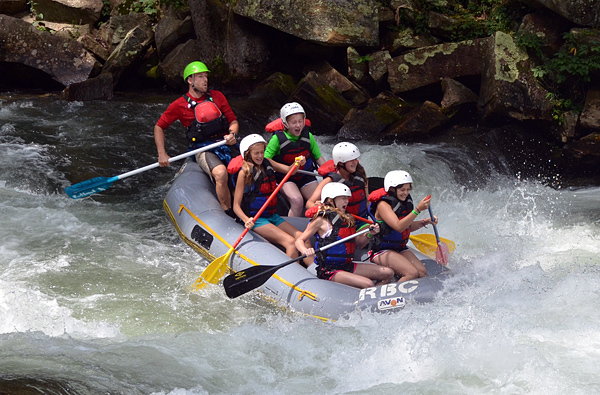 Well, I may have gotten a little carried away here, but I wanted to report that your girls aren’t just eating pancakes on the hill in their PJ’s, or learning to build a fire, or blasting through the Nantahala Falls, or singing ’till their their throats hurt, or zipping down sliding rock— all things we enjoyed today. They’re making independent decisions all day long, and you’d be very proud, maybe even a little surprised, to see how confidently and responsibly they are making their way. Take a brief tour of camp, and it will quickly by obvious that these Rockbrook girls are doing amazing things. 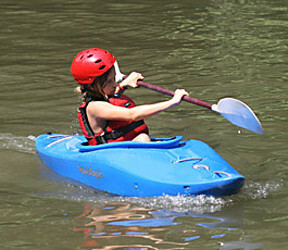 Yesterday I mentioned hand rolling kayaks, but there’s a long list of other extraordinary accomplishments we could name. 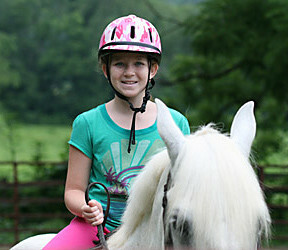 Girls are riding and jumping horses over 2-foot rails. They are swimming laps in the lake, smashing tennis balls on the courts, and doing gymnastics flips off the balance beam in the gym. 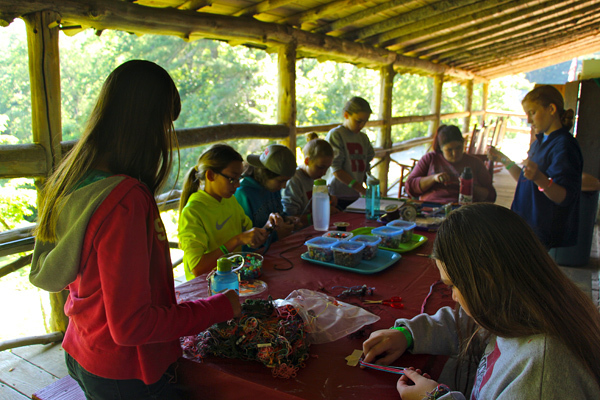 Rockbrook girls are showing their creative talents by sewing pillows, weaving cloth on wide floor looms, and tying intricate friendship bracelet patterns. Their pottery is as beautiful as their shooting form in archery. These Rockbrook girls are light on their feet and quick with a song. Seeing them interact with each other is equally impressive. They’re happy to help one another, to be kind and caring, and incredibly generous, knitting our community tighter everyday. And they’re doing all this themselves, being remarkably successful without their parents’ continual guidance. 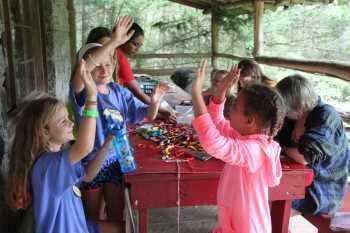 This is significant, of course, because it reminds us that camp, particularly a sleepaway camp like Rockbrook, provides consistent experiences that boost girls confidence and self-esteem. At camp, it’s simple to feel good about your individual achievements because you see the results. Our days here are filled with moments, thanks to the enthusiasm and support from the community of great people around us, when girls think “Wow! 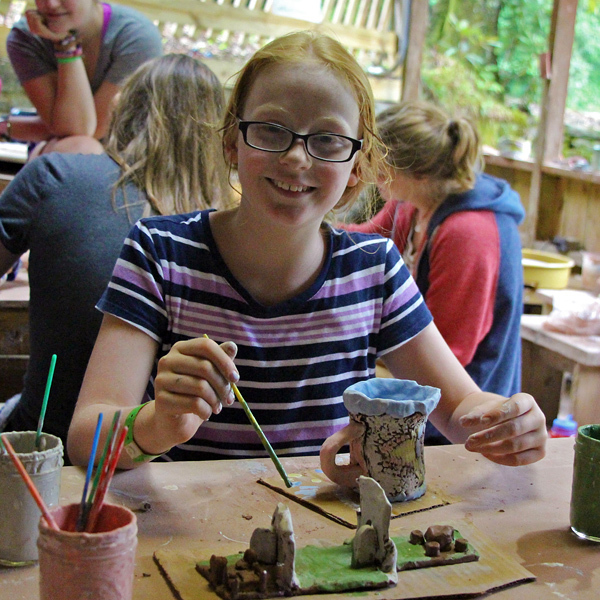 I did it!” No matter their age or experience, their abilities or talents, and without too much concern for the outcome— whether the pottery mug is straight, or every serve clears the net —Rockbrook girls know they are competent and strong. They are given the freedom and responsibility to make their own decisions. They are empowered to be themselves, and celebrated when they do. Camp proves their “personal capacity.” At Rockbrook, girls “can do it,” all while having fun with whomever they’re with. 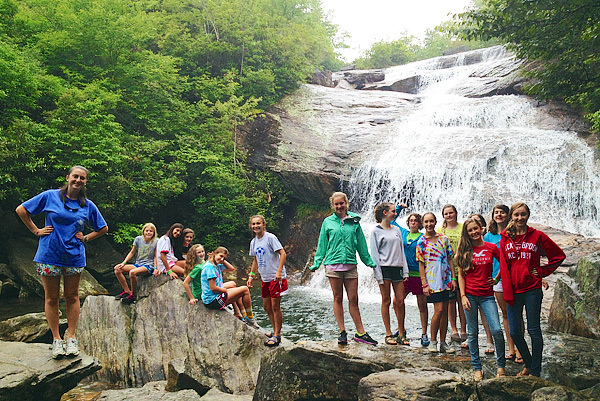 Rockbrook shows what it means to do something “like a girl.” And as you can see, it’s awesome. Have you seen the #LikeAGirl video that’s making the rounds? Documentary photographer and filmmaker Lauren Greenfield made it and it’s got more than 47 million views on YouTube. The video reveals how often “like a girl” is used derogatorily, and thereby can have a significantly negative effect on young girls and women. 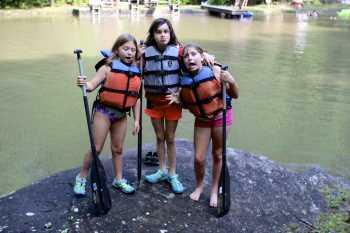 The video also proves, however, like camp, that doing something “like a girl” is amazing. 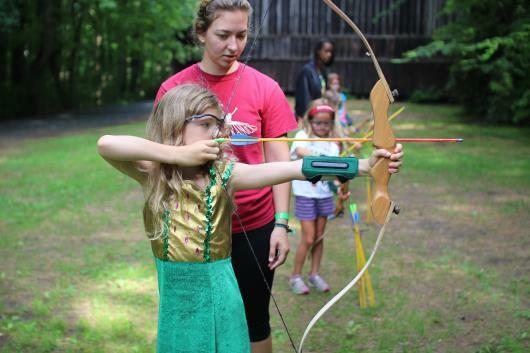 Being a girls’ camp, you don’t hear that phrase very often because after all, everything we do here is “like a girl,” but it’s clear to me that the experience of camp is having a powerful effect on the meaning of this phrase for everyone here. We’re all helping each other build skills and abilities, become more confident and self-assured, and be our authentic selves no matter what we do. It’s obvious; these girls have power, talent and insight. 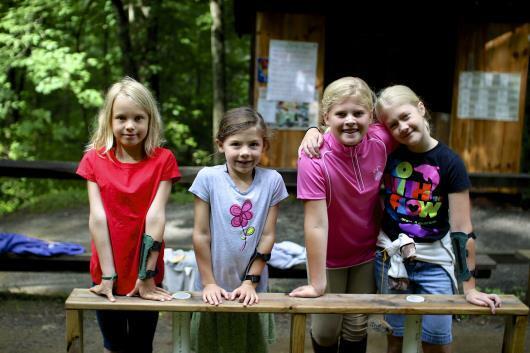 The video hopes to “Champion Girls’ Confidence.” At camp, we’re doing exactly that. 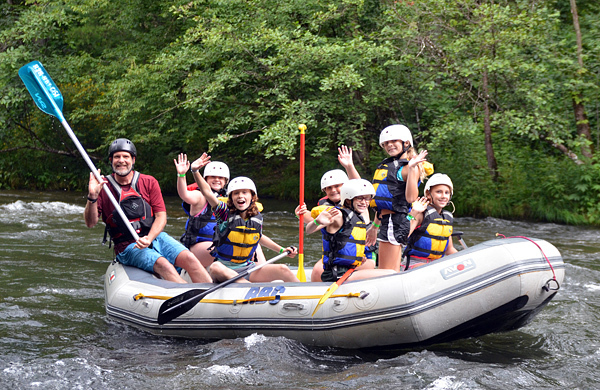 When we finish a session at Rockbrook and the girls have returned home, we always send out a brief survey to parents hoping to receive some feedback about their girls’ time at camp. We ask questions about all aspects of the experience, from the activities, the health care, and the staff to the special events and the food. It’s always very interesting (and helpful!) 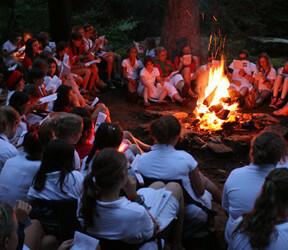 to learn how camp succeeds and where we might improve the way we do things. 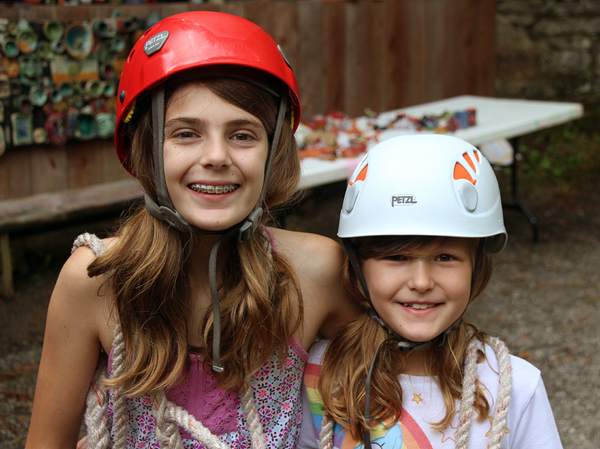 Two of the final questions ask parents to describe the most challenging, and the most rewarding, aspect their girls encountered while at camp. I wanted to share an insight one parent mentioned in her response. This parent reported her daughter being challenged by some of her cabin mates, “getting along with them,” but then suggested “being flexible and understanding others” was a clear reward as well. For this parent, and likewise for others I would guess, camp life for her daughter was not at first entirely comfortable and easy, but because of that, it provided very important lessons. To be an opportunity for growth, it was at first challenging in an beneficial way. This is spot on. 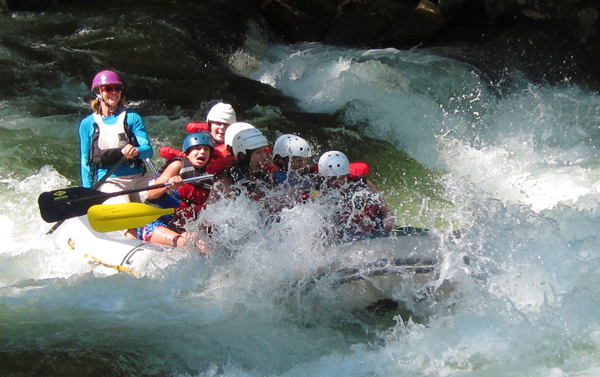 Being at summer camp, certainly the first time, means entering a foreign environment where the familiarity of home is replaced with all sorts of new experiences that can feel strange or even a little scary to a child. There’s unusual food… “Did you try the falafel?” There’s our mountain forest environment itself with its weird plants, perpetual parade of insects, eerie sounds at night and funky organic smells. At camp there are “never-tried-it” things to do like climb a real rock, improvise a character on stage, or knit a hat, for example, all which might appear “too hard” at first. Camp, of course, is the perfect environment to try all these things, to go beyond the ordinary, and to learn what each requires. With the right combination of coaching and encouragement from our staff, girls will step “out of their comfort zone” and gain pillars of confidence that will support them in the future. This parent comment, though, identified one of the most complex and equally inescapable aspects of camp life, and that which often requires the most adjustment for girls: the social dimension of the cabin. 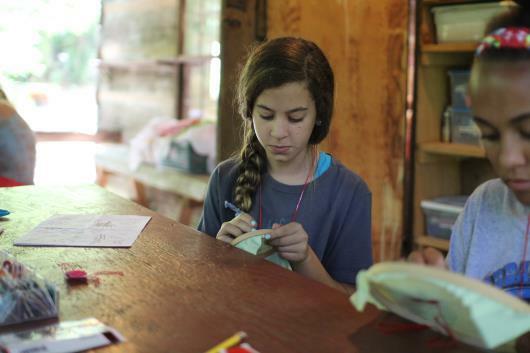 Camp cabins are made up of girls who might talk in their sleep, and others who might like waking up early. There may be a messy girl and a “neat freak” who have to share a bunk. Each cabin will undoubtedly be a mix of shy and outgoing girls, crafty and sporty girls, some voracious and others picky eaters. Working through all these differences, learning to be elastic when necessary, is simply part of cabin life. 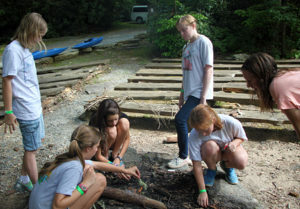 Most essentially, camp requires getting along with the other girls, getting to know them and finding ways to understand them. 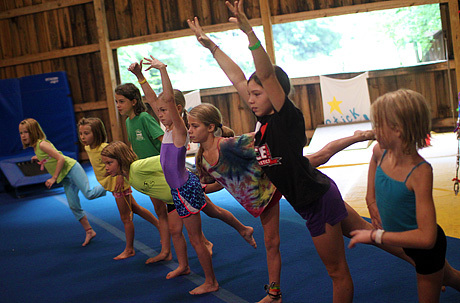 At Rockbrook, the cabin counselors, their training, personality and instincts, recognize this goal and work tirelessly to help everyone be more flexible. Everyone on the staff is keenly aware of this social dimension, sensitive to it, and ready to step in whenever a camper has trouble (or might subtlety be causing trouble!) in the cabin. For some groups, learning this elasticity can take time, but generally the girls understand its value and are quick to exercise it. This is good stuff because this kind of social elasticity is a skill that really benefits children. After all, learning to adapt to various circumstances, making adjustments to others as needed, is the mark of a well-adjusted person who deals effectively with disappointment and is capable of creative problem solving. Throughout life there are situations when we are called upon to be flexible for a greater (often collective) good, so its important for our children to bank experiences where they have done so effectively. Again, with guidance from their counselors, life in the camp cabin provides exactly that. Here’s a photo of a GaGa (or Ga-Ga) game. Sometimes called “Israeli dodge-ball,” or “Octo-Ball,” and literally translating as “touch-touch,” this is a form of dodgeball played inside an octagonal court made of 3-feet-tall walls. Any number of players and any aged-camper can play, making it a great camp game. 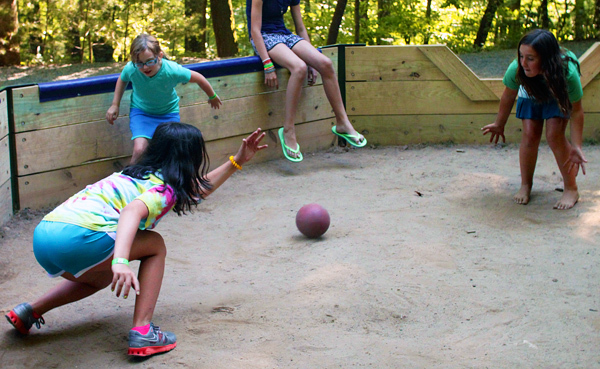 During free time and sometimes during the Sports and Games activity, there are groups of campers eagerly playing. The games are fast-paced as players use their hands to knock the ball trying to hit other players in the leg. Once hit (or if she hits the ball out of the pit), a player is out. Like other forms of dodgeball, play continues until only one person remains. It’s even fun for girls after they are out and have to stand on the outside of the pit because they can still play in a way. They can lean into the pit trying to hit the ball, and if they successfully hit another person out, they get to return to the game. Game after game, the girls are really enjoying GaGa. Finally, I can’t help but include this photo from our Twilight “Diva Dance Party” tonight. I was an hour of fun pop songs, costumes, and silly dancing… just your Rockbrook girls having a great time. Yesterday afternoon, our current mini session Seniors and their counselors packed a lunch for a trip to this waterfall located up on the Blue Ridge Parkway. Not knowing what weather we’d find at that elevation (a little over 5,100 feet compared to Rockbrook’s 2,300 feet), we took our chances and made the long climb in the buses up US276. As we ascended, however, the mistier and foggier it became. Finally up on the parkway, we stopped for a view and found we were within the clouds, completely immersed in the grey vapor and soon quite cold from the driving moist wind. Needless to say, there was very little “view,” and suddenly our picnic plans seemed at risk. We realized though, driving a bit further, that the wind was the culprit, and that with some shelter, the view to the north was sensational and the outside temperature was suitable, albeit still a little cool. The rain was very light, barely a mist, so we were able to find a nice overlook and have our picnic after all. Once at the trailhead for our hike, it began to rain a little harder and again I could tell from the looks on a few of the girls’ faces, there was some doubt that we could continue. Fortunately, though, the rain blew past us quickly and we could reach the waterfall without too much effort. Sure we got a little wet, and yes we had to take extra care scrambling down and over wet rocks, but the trail, lined with glistening bushes, was gorgeous and the falls were magnificent. Despite what first appeared as terrible conditions, our determination and perseverance rewarded us in the end. 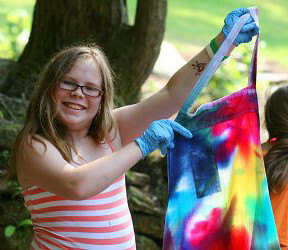 In addition to “Play Outside this Summer,” which I wrote about here, one of the Rockbrook tag lines is “A Place for Girls to Grow.” It is another short phrase that, also like our mission statement, summarizes the goals we have for your girls at camp, our aspirations for everyone at Rockbrook. 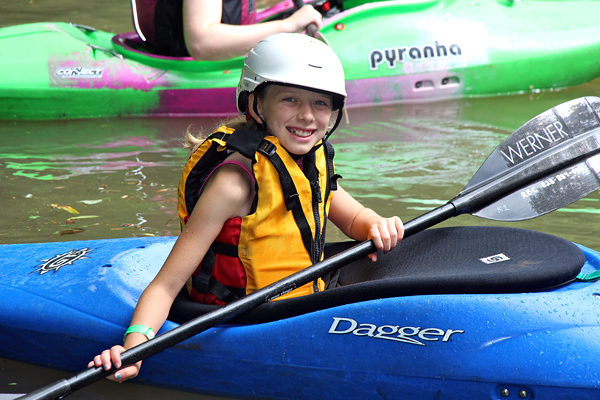 Quite simply put, we hope your girls will grow from their experience at camp, that they will develop in important ways, all the while having the time of their lives. We want camp to be for them both formative and fun. 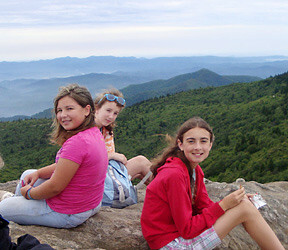 This hiking trip, as is true for so many other experiences at camp, is a good example of how this growth takes place. It created for all of us a set of personal challenges and thereby opportunities to learn. Beyond dealing with slightly uncomfortable weather, it presented physical challenges because it required us hike a steep trail and at one point to balance carefully over slippery rocks. 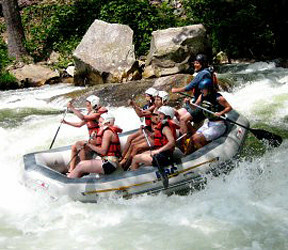 It required true teamwork as each person helped another through one especially tricky area. The hike demonstrated that a positive attitude— an enthusiastic, supportive, encouraging, friendly approach— is powerful and often a crucial part of a successful group endeavor. It provided experiential evidence that setbacks and disappointments can be overcome with perseverance. 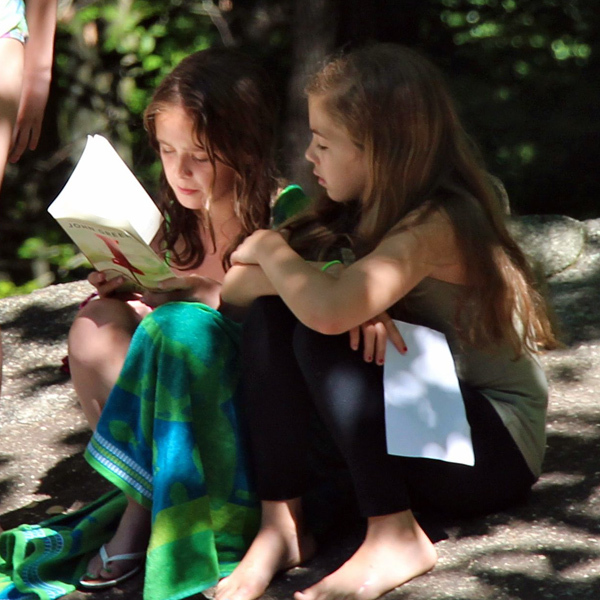 It became another page in a wonderful book of experiences your girls are writing at camp, a book filled with life lessons that will undoubtedly play a role in their later success. So many of the other challenges at Rokbrook provide these opportunities to grow too. On the surface of things we are sewing pillows, weaving baskets, balancing on the beam, paddling canoes, shooting rifles, and getting to know each other while relaxing in the grass before lunch. We are doing amazing things everyday. But what’s most important about camp lasts much longer. Years from now your girls probably won’t remember very much about what they did or didn’t do at camp. They’ll forget that hike. Instead, they’ll recall the positive feeling of being a part of a caring community. They’ll know first-hand how honest communication, compromise and cooperation makes every group grow closer, more powerful, and rewarding. They’ll be more confident, more resilient, and more courageous when faced with challenges later in life. From their time at Rockbrook, we know they’ll have grown. There are many marvelous things in store for these girls later in life. We’re quite proud to join you in guiding them toward that future success. When asked what my favorite day of camp is (an unsurprisingly frequent question around here, considering the sheer number of exciting events that pepper our schedule), I almost always say Banquet Day. The final Tuesday of camp, two days before parents return to retrieve their daughters, thrums with mounting anticipation, as all but the oldest campers (or CA’s, who plan the event) mill about the outside of the closed-off Dining Hall, eager to find out the secret theme of the final Banquet. The girls have all become perfectly at ease with each other and with themselves by these final days of camp—they stroll through the camp that has come to feel like their very own in just a few short weeks, headed for one last dip in the lake, or to polish off the final coat of glaze on their piece de resistance in pottery. In the evening, all that easiness lifts into jubilation, as the girls laugh through the Banquet skits put on by the CA’s, indulge in the delicious dinner and candy spread across the tables, and dance to the music coming through the loudspeakers. 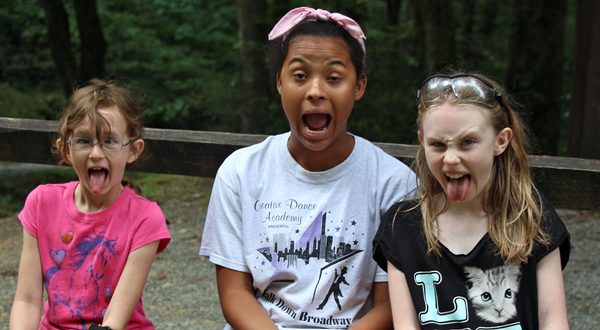 The campers know that this is their last chance to let loose and act goofy before the return to the real world, and you can sense their determination to make the most of it. 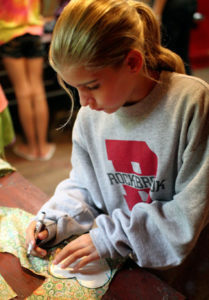 The sheer energy that pervades Banquet Day is what gives it the top spot in most Rockbrook girls’ camp memories—including mine. But walking through camp today, stopping in for a while on every activity I passed, I realized that the first full day of camp just might deserve some more acclaim. The girls are nervous, sure, and certainly much quieter than they will be three weeks, two weeks, or even one week down the road. They explore this new space tentatively, poking heads through cabin doors, and quizzing passing counselors on which path leads to Nature Nook, and which leads to the barn. They still have their best manners on, those “please’s” and “ma’ams” that have guided them through long days at school. They place novice hands on looms, clay, and canoeing paddles, and laugh nervously when they stumble through their first tries. But as the day goes on, if you pay close attention, you can see those polite shells that the girls have spent the whole school year crafting begin to crack. Smiles become quicker, laughs become louder, and footsteps on uneven mountain paths become surer. You get to watch as the campers realize (or remember, for the returners) just what they’re in for here at Rockbrook—that this is the sort of place where, if you were suddenly to get the urge to put on a crazy costume for no reason, no one would look twice, and more than likely, others would hurry to join you in dressing up; where, while we place a premium on treating others with respect, no one expects you to tiptoe through those tricky rules of courtesy set up in school; where no one cares about the labels on your clothes, the school crest on your backpack, or the grades on your last report card—they only want to know if you want to join in the tetherball tournament. By dinner time, the Dining Hall is twice the volume it was at breakfast. Girls excitedly fill in their cabin mates and counselors on what they did that day, returning campers teach the camp songs to the new ones, and the Hi-Ups lead the rest of the camp in song after song, creating a happy din that spreads out from the Dining Hall, all across the still camp. As energized and as vibrant as the Dining Hall has become in just twenty-four hours though, there is a long way to go yet before we reach the levels of Banquet Day. Over the next two or four weeks, these girls will face experiences that challenge them, that push them past their comfort zones, that make them laugh, make them cry, make them dance, make them sing, make them create, and make them wish that they could stay longer and experience even more. That’s what makes this first day so exciting: today is the day they get the first sense of what awaits them in the days ahead. But all of that is still to come—today was just the start.